The CD15 antigen (Lewis x or Lex) is the lacto-N-(neo) fucopentaose III molecule. This carbohydrate epitope is carried by both glycolipids and glycoproteins expressed on the cell membrane. 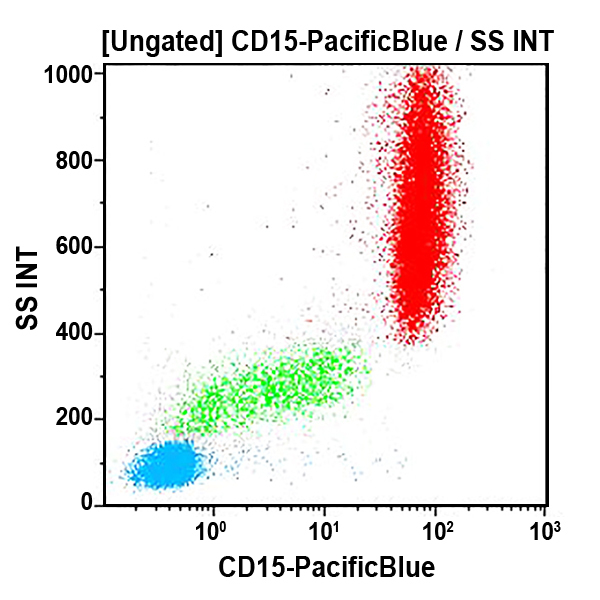 CD15 antigen is strongly expressed by neutrophils, eosinophils, monocytes, macrophages, mast cells and normal myeloid precursor cells. It is not expressed on normal erythrocytes, platelets or lymphocytes. *Alexa Fluor and Pacific Blue are registered trademarks of Molecular Probes, Inc.